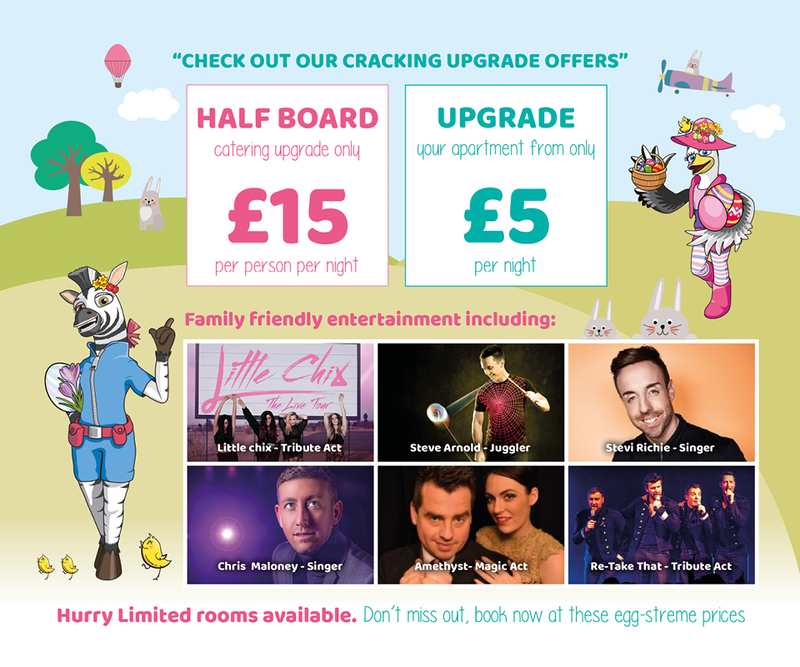 This Easter we have some truly great deals for you so check them out and book today! Easter is a fantastic time to visit your favourite Pontins UK Holiday Park. With spring starting to show on the ground and the cutest wildlife running around our sites, you are sure to get that spring fresh feeling on a Pontins UK family Holiday. You will also have access to our Pontastic Entertainment and we also have a huge range of family friendly Easter Activities for everyone to enjoy! The kids will love our Easter Themed Parties, Bluecoat & Character Shows, Easter Fun & Games, Croc Crew meet & greets, Bluecoat activities and all the other great Easter fun we have planned! All our 2019 Easter sale dates can be found in the tables below and don’t miss our upgrade and half-board catering deals at the bottom of the page. Book now and join us this Easter for a “Cracking” holiday in the UK filled with fun, fun, fun and so much more!